Fluval Chi Aquarium is a modern nano aquarium by Hagen inspired by ancient Chinese culture, Chi (pronounced ‘tchee’), describes the life force of living things and symbolises the positive effects of energy. The flowing water of this fluval aquariums type is believed to encourage Feng Shui, bringing prosperity and good luck to your home. As the modern Chinese nano aquariums, the Fluval Chi was carefully designed to create the perfect balance of sight and sound to help inspire the positive life flow energy of Feng Shui. The bright, shining and the sound and motion of bubbling water create a calming and sensory ambience, making it the perfect addtion to any home. With striking artistic simplicity, fluval Chi makes a stunning aquatic feature. Chi is versatile and manageable too and provides a stylish habitat for some fascinating fish species. As with all Fluval nano aquariums, Fluval Chi is easy to set up and maintain and, with a beautiful range of accessories to choose from, allows you to create an individual look to suit your mood or surroundings. Fluval Chi is a nano aquarium which creating serenity. Relax to the gentle sound of flowing water and the graceful movement of fish as Chi brings a peaceful ambience to your space. Chi includes a safe, low voltage lighting system so in low light places the aquarium takes on a glowing, peaceful beauty of its own. No wonder, the Fluval Chi delivers an appealing aquarium, making the ordinary, truly extraordinary. Fully equipped and easy to set-up and maintain. 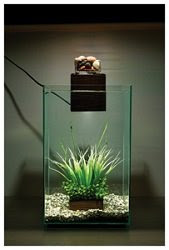 Fluval Chi aquarium is available in two sizes (5 gallons and 6.6 gallons). It is designed with an open top design for tranquility. The Fluval Chi utilizes a full three stage mechanical, chemical, and biological filter, specifically designed to prevent water bypass, provide clear water, and promote a healthy nano living environment. Two separate filtration media are available for the Chi: the foam pad and filter pad. The foam pad should remain in the filter to foster biological growth while the filter pad removes finer debris and chemical impurities through carbon filtration. The design of the filter is especially unique to the Chi in that water is brought in from the bottom of the "box", passed through the filtration media, and bubbles out over the top in a calming waterfall-style feature. Fluval Chi features two separate cool-white LED lighting units: a 12 LED submersible light unit illuminates the aquarium from the bottom of the filtration box, while a second set of LED's shines upward and lights the water as it flows back into the aquarium. This creates a stunning nighttime visual and casts a soothing aquatic glow onto the ceiling of the room. The 6.6 gallon model also features a remote control lighting system. The plant basket easily slips out of the plant box and can be filled with Fluval Chi decor pieces (sold separately) or natural plants to complement the Fluval Chi surroundings. Positioned on the top of the filtration cube, the decor tray holds either the pebble basket or additional decor pieces (available separately), which soften the sound of the trickling water. The 180 degree rotating filter head and easy access media cover ensures routine maintenance is quick and simple to do. Recommended types of fish for the Fluval Chi are Goldfish, Bettas, Guppies and Danios. Allow a minimum of 1 gallon of water for every 1 inch of fish, excluding tail. Fish are usually sold as juveniles, so you will need to allow some extra space for your fish to grow. If you chose tropical fish, remember that some require the use of a heater. Also, some fish may attempt to jump, so the open top design of the Chi could limit your choice of fish. 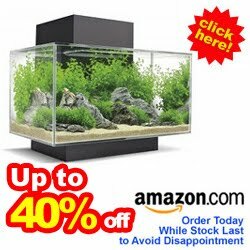 Here are some reviews by real customers who have purchased Fluval Chi. 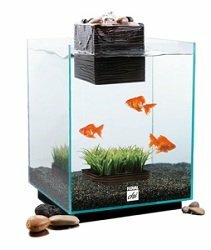 Read pros and cons of this this nano aquarium model and discover what other shoppers think about its various features, set up and performance to figure out if the aquarium does indeed suits to their fish. I didn't purchase my Chi from Amazon, but I've had it for a year and wanted to share my input. This is a perfect aquarium for some aquarium life/plants, or even just to have plants only. In fact, I'm buying two more this week for my living room! There's several great reviews which go over the Chi in depth so I don't want to reinvent the wheel, if you'd like to see those as well just go check out the 4 & 5 star reviews. What I want to bring attention to is the fact that most, if not all, of the reviews under the 1 & 2 star section aren't the fault of the Chi, they seem to be the fault of an inexperienced aquarist or someone who hasn't done the research on the type of life they're putting in the tank, with exception of one or two reviews which mentioned equipment problems such as the power supply going bad. 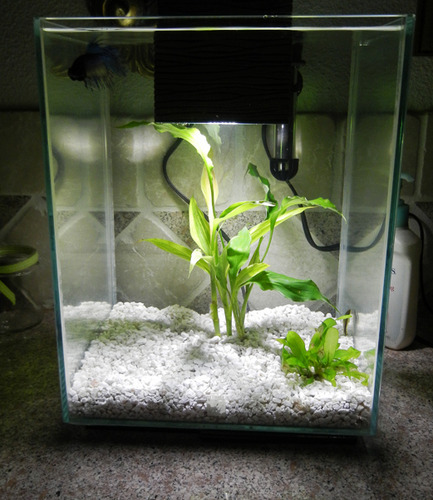 The Fluval Chi comes equipped with everything you need to get your calming aquatic environment started: a center filter/light cube with switch, a foam and filter pad, a transparent pebble holder and pebbles, an in-tank decorative plant basket, along with one ounce of Aqua Plus, one ounce of Cycle and an instruction manual. Inspired by the Chinese Chi philosophy, Fluval Chi helps stimulate the essence of Chi-inspired values such as life, health, prosperity and everything that is positive. The Fluval Chi tank delivers an appealing aquarium, making the ordinary truly extraordinary. It was designed to radiate positive energy throughout any home or office. Its elegant yet subtle lines and harmonious balance of light and sounds provide a stylish, contemporary decor piece to any setting. The calming aquatic setting creates a profound sensory and spiritual experience by combining the soothing sound and motion of bubbling water with ambient illumination. This tank is beautiful, tranquil, and perfect for a betta or 3 fancy guppies, but not much else. I HIGHLY recommend this Fluval Chi aquarium for those with a betta. Please, remember to research animals before you bring them into your home that way you can enjoy nano aquariums like this Fluval Chi for what they have to offer. Get The Best Price !! Fluval Edge is one of the most popular and iconic nano aquariums available today. 2011 will see the launch of the redesigned Edge range with a larger size option and a new ‘Day & Night’ LED lighting system.